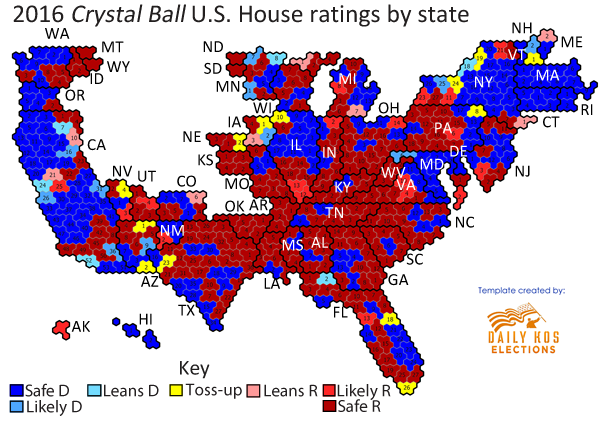 Our friends over at Daily Kos Elections, a left-leaning site that produces reams of useful, nonpartisan political analysis and resources, just rolled out perhaps the best map of House districts we’ve seen. Visualizing our House ratings is challenging because of the wide disparity between district sizes. The smallest congressional district, that of retiring Rep. Charlie Rangel (D, NY-13), is just about 10 square miles, or less than half of the size of Manhattan. Rep. Steve Pearce (R, NM-2) holds the largest, non at-large district, which at about 72,000 square miles covers the southern half of New Mexico and is bigger than the state of North Dakota, one of the states with just one, at-large district. This leads to an obvious problem: Some districts are very hard to see on a traditional district map. So the best way to show them is to make them all the same size, which is what Daniel Donner did for Daily Kos Elections. We took Donner’s map and added our own House ratings. We’ll be using it from time to time this cycle to provide a much-needed illustration of the competitive seats in the House. Donner’s work reminds us of a map we put together after the most recent census, the Political Map of the United States. The political map sizes the states based on their population to give a more accurate view of how much weight they carry in the Electoral College. 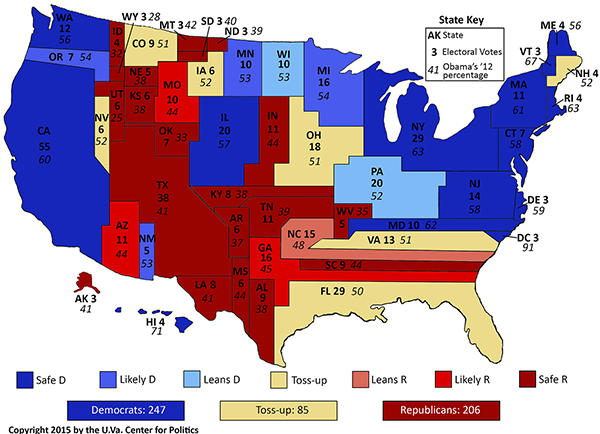 Map 2 shows the political map along with our 2016 Electoral College ratings.